Several track days have come and gone. I've moved to yellow group and reduced my track times by about 10 seconds. I've also aquired some Nitto NT01's but have yet to put them to the test at the track. The car's running an etune and pushing 309 awhp and 326 torque. Injectors, fuel pump, and electronic boost controller are on the way and soon I'll run E85. Hopefully make some significant power. 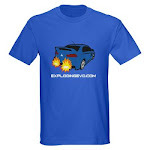 I've set up my youtube channel called The Exploding Evo. Hopefully I can make some entertaining videos of the different tracks I visit.